Not as daunting a list this week for the Independents and no miscellaneous or misplaced titles. Things have been pretty quiet for me this week, not a whole lot to talk about. Finally grabbed Great Darkness Saga by Paul Levitz and Keith Giffen. Looking forward to devouring that after I've devoured Easter Dinner. Oh ya, I wanted to give a quick refresher on my little legend underneath the write ups in case I've picked up any newcomers. SRP = suggested retail price, CRD = Canadian release date, ('cause I'm Canadian, eh?) and, as always, TPB = trade paperback. 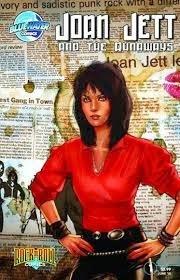 And for no reason at all check out this Joan Jett comic book. I bet it sold like crazy! 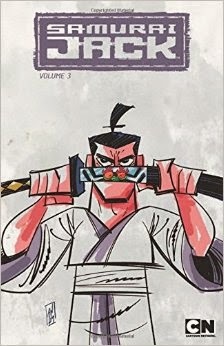 Continuity Alert: Seems there's a Samurai Jack Classics that precedes this title which includes stories from a Cartoon Network comic called Action Pack. Doesn't sound essential to enjoy this new title, but, depending on your level of fandom, it could be worth checking out. I don't really like highlighting the same publisher multiple times, but IDW's got the goods this week! Alongside this magnificent mash-up and the previously highlighted Samurai Jack they're publishing new stories from Transformers and Star Trek, (love Trek!!). IDW's just plain fun usually. 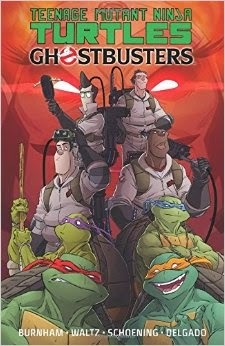 Even though the plot for this is pretty thin, (some sort of invention goes haywire and the Turtles are sent in to the Ghostbusters version of NYC), it doesn't matter. No one reads a mash-up for the stunning word play and literate, thought provoking characterization. And if they do, they probably only read one. The reason I chose this is the publisher is releasing volume 2 and a hardcover of some sort all at the same time which piqued my curiosity. What I've gathered is this particular book, (Volume 1), is a 25th anniversary reprinting of a "complicated, multi-genre tale". The Volume 2 that's listed in The Rest is a prose novel, (no pictures), and a prequel written by the author to go along with this book. The hardcover that's listed is this book, only without the Recalibrated sub-title. That's why I love doing this blog; I found out about a book that's supposed to be smart and action packed, (a rare combo), that I probably would not have heard of otherwise. One day I'll have to read it and see if it lives up to the considerable hype.